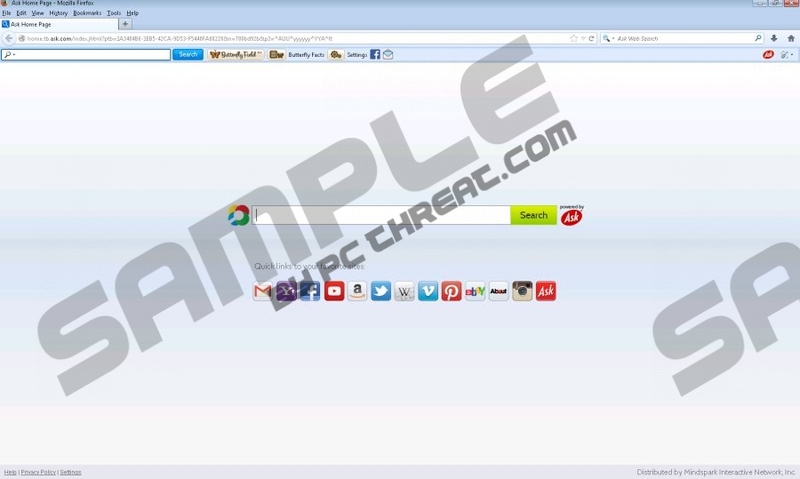 ButterflyField Toolbar is an application which you can attach to your Mozilla Firefox, Google Chrome and Internet Explorer web browsers. The extension is represented at free.butterflyfield.com/index.jhtml, and our researchers have discovered that its developer is the infamous Mindspark Interactive Network. Some computer users may be familiar with this company because it stands behind such browser plugins as Gaming Wonderland Toolbar, OnlineMapFinder Toolbar, and Daily Bible Guide. Since the toolbar comes with one built-in easy-access button (Facebook) only, there is no doubt that its main purpose is to promote the ButterflyField screensaver. The program has also been discovered to promote Ask Web Search tools. If you are not interested in either of these, we recommend that you remove ButterflyField Toolbar. If you have downloaded Ask search tools accidentally, it is likely that you will want to delete them from the browsers. You may want to delete ButterflyField Toolbar as well because this extension is not exactly useful and running it has no purpose. In order to remove the undesirable software from the PC, you can follow the manual removal instructions which are presented below. Make sure you check all installed browsers to make sure that undesirable plugins and search tools are not installed onto them. If you have installed the toolbar using the services of third party distributors and additional software was installed alongside, you should use automatic malware removal software to ensure that potential threats are eliminated. Double-click Add or Remove programs to find installed software. Select All apps, then click Control Panel and Uninstall a program. Now right-click the program you wish to delete and select Uninstall. Click Options and then click the General tab on the left. Overwrite/remove the Home Page URL and then click OK.
Click the search provider icon placed on the Firefox search box. Tap Ctrl+Shift+A to open the Add-ons Manager in a new tab. Go to Extensions and Remove the undesirable plugins. Open the browser, simultaneously tap Alt+T and then select Manage Add-ons. Navigate to the left and click Toolbars and Extensions. Disable the undesirable plugins and move to Search Providers. Click the General tab, overwrite/remove the Home Page URL and click OK.
Remove/change the undesirable URL and click OK. Under Appearance select Show Home button, click Change and then repeat step 3. Go to Search click Manage search engines and choose a new default search tool. Now remove the undesirable search tool by clicking the X mark and click Done. Tap Alt+T again, select Tools, then Extensions and Remove the undesirable plugin. Quick & tested solution for ButterflyField Toolbar removal.